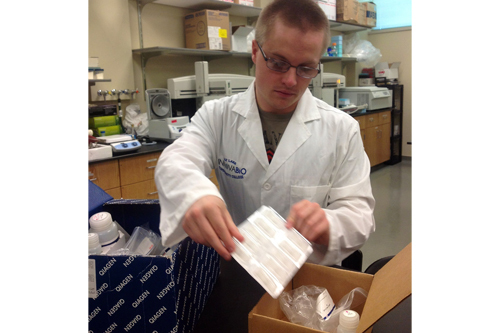 Kasey Shuster is the Biotechnology Outreach Coordinator at Salt Lake Community College, Salt Lake City, Utah. We asked Kasey a few questions about the type of work he does and the preparation required. I also attended Utah Valley University, in Orem, Utah. What degrees or certificates did you obtain? As Outreach Coordinator for the Biotechnology Program, my job includes working with the surrounding high schools and getting them involved in a sequencing project funded through NSF. We bring all the tools and reagents required out to the schools, giving them the opportunity to learn hands-on research skills and experience sequencing a local halophile called Halorubrum salsolis. My days involve answering questions from the high school instructors that are working on the project. I also prepare the raw reagents needed for the instructors and back-up products in case something doesn't work out with the students' experiments. I then drive to the schools and deliver the supplies and answer questions from both the instructors and students. If needed, I assist in instructing. My advice would be to get involved with any program you can that will allow you to get the hands on experience. The more experience that you have in the lab the better prepared you will be when you start applying for jobs. Also insure that you work closely with your instructors and keep in contact with them. They will be able to provide you with the references needed while applying. They also hear about jobs frequently and are likely to inform you when jobs are available.